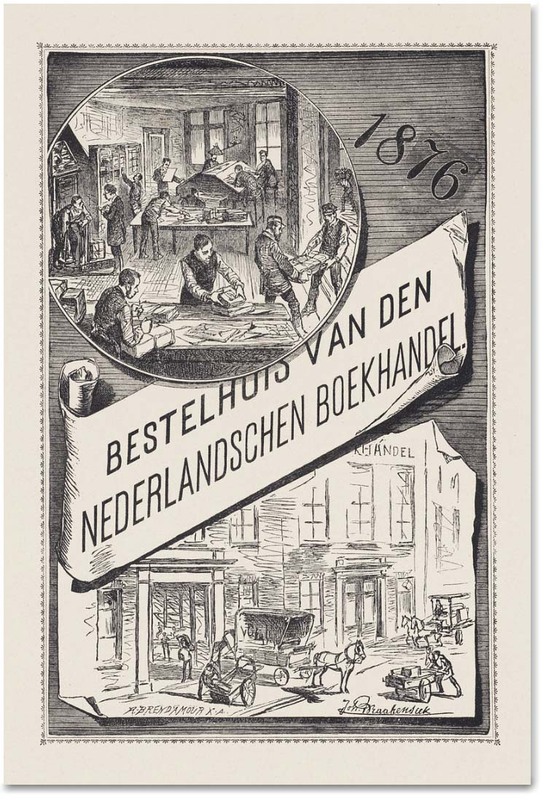 Catalog cover for an association to promote the interests of booksellers in Amsterdam in the 19th century. 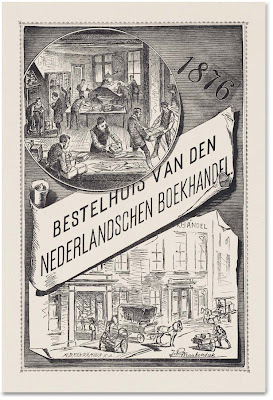 Below is an 1876 advertisement for a bookstore. 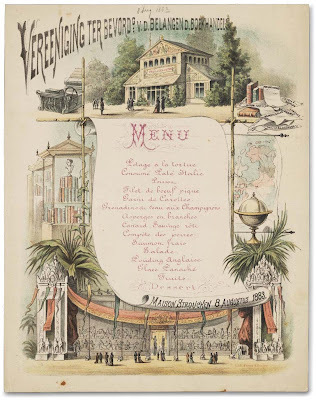 1883 menu for the Book Society dinner. Lithographed bookstore poster, 1903. Designed by William Bernard. Below is a promotion for the International Exhibition of Books and other related subjects. 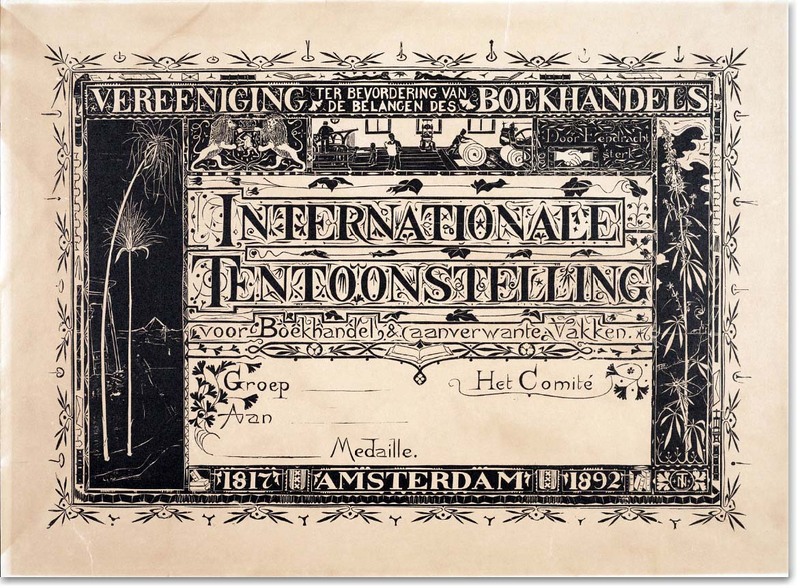 Drawing of an exhibit for the Netherlands Booksellers Association. 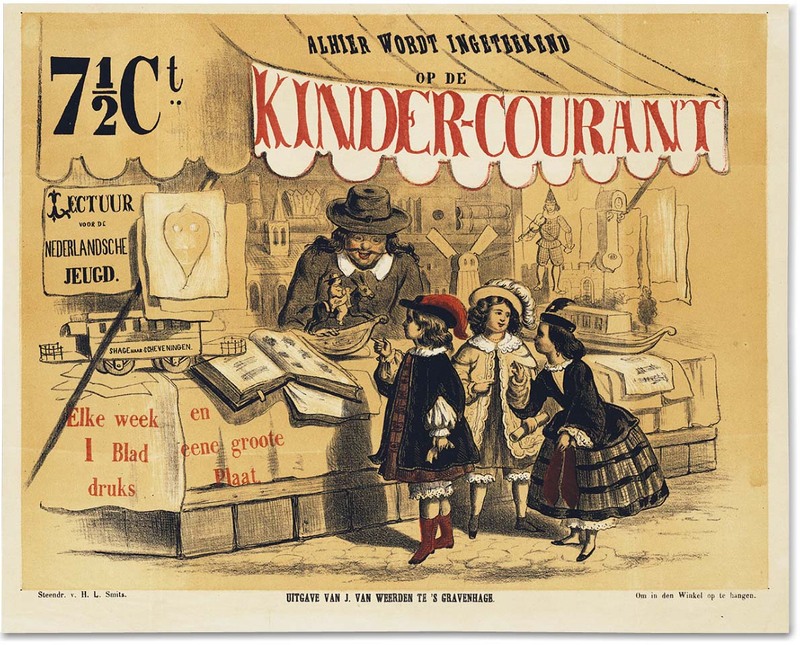 Below is a chromolithographed poster from 1875 for a children's bookstore. The book trade in Europe during the early part of the 19th century was a prospering and flourishing industry, despite few major advancements since Gutenberg's era. 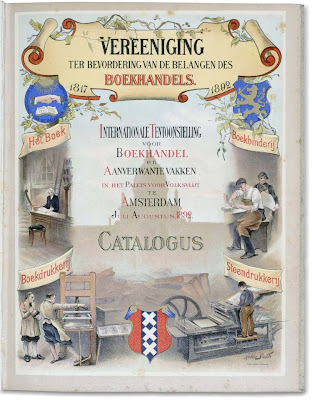 Earlier this month I reported on a Dutch book about The Making of Books in 1850. This happens to be sort of a companion post to it, and just like the earlier post, these images of the 19th century book trade in the Netherlands also belong to the University of Amsterdam's Bibliotheek van het Boekanvak, or the library of the Book Trade. Their rich archive contains booksellers' catalogs, type specimens, posters, source material about the production and design of books, and ephemera from the printing industry. This library contains one of the largest and most comprehensive historical collections in the world documenting printing and book design. 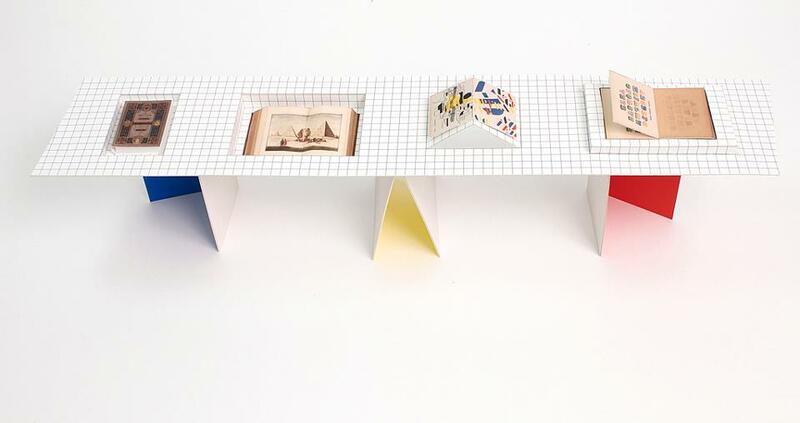 This just in: For those of you lucky enough to be in Amsterdam between February 8th and May 13th 2012, you might enjoy visiting the University of Amsterdam's exhibition, The Printed Book, A Visual History. The exhibit and companion book by the same name which is compiled by Mathieu Lommen, curator of graphic design, covers 500 years of Western book design. 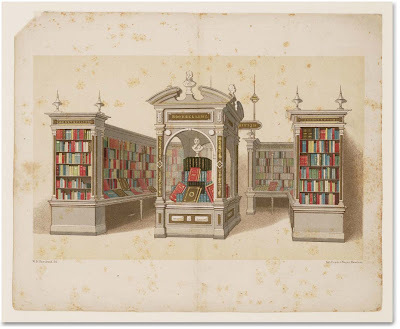 According to the press release, "It showcases book design in all its forms: reference works, and works of art, 'for reading machines' and picture books, prestigious collector's items and throw away paperbacks. 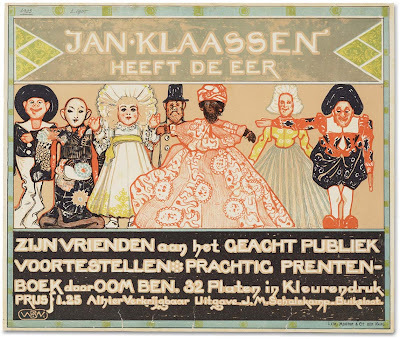 It includes work by famous printers of the hand-press period—Nicolas Jenson, Aldus Manutius, Christophe Plantin, the Elzeviers, John Baskerville, Giambattista Bodoni—and trendsetting designers of the modern era—William Morris, El Lissitzky, Jan Tschichold, Paul Rand, Massin, Irma Boom. It also includes remarkable illustrated works by architects and artists such as Giovanni Battista Piranesi and Maria Sibylla Merian. Special attention is devoted to printers' manuals, illuminating the printing process, and also to type specimens and writing masters' copybooks, placing letterforms in a broader context." 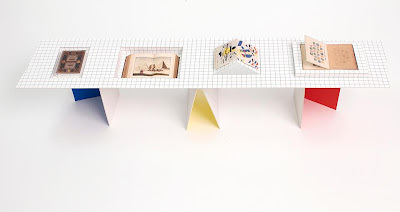 Below is a glimpse of the exhibition design by Experimental Jetset. I am so ready to pack my bags!